New Members - headingleybadderss jimdo page! It's very easy - we are an open club, just come down and join in with a few games on one of the advertised club nights. £4 for members and £5 for non members. Membership fee of £50 is compulsory for all match players. The standard of our club play is reasonably high so is not suitable for beginners. However, as well as players from the 6 league teams, we have a regular stream of non-competitive players who attend club nights. Age group is mainly between 20 to 35. There is a membership base of around 50 players at any one time with about 20 turning out on a typical club night. 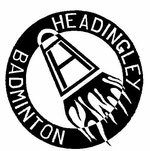 We are a friendly bunch and organise social events throughout the year such as Christmas meals out and an annual trip to watch the All England Badminton Championships in Birmingham. Touchy subject, the landlords aren't too keen, so if you're an old looking teenager no worries, younger peeps are welcome (and free) on Sundays during the Summer when accompanied by a playing and paying adult. No, but if you're over 70 our normal insurance doesn't cover you, so will need a little bit of warning to sort that out in advance. Do you take good quality players? Yes, there are league teams and tournaments to have a go at. We currently have 3 men's teams, 2 mixed teams and a ladies team. Do I need to contact you first? No, but it's a good idea to just in case the courts are closed. Can you give me coaching? We do not provide coaching at present. Go look at our facebook page - I daren't stick some of the pics on this site, but it'll make you laugh. Can I book courts from you? No. Go speak to the leisure centre staff - google "forum leisure centre Leeds" for the phone number.